Getting into the M43 game cheaply.. sorta. Discussion in 'Olympus Cameras' started by psknapp, Feb 16, 2013. 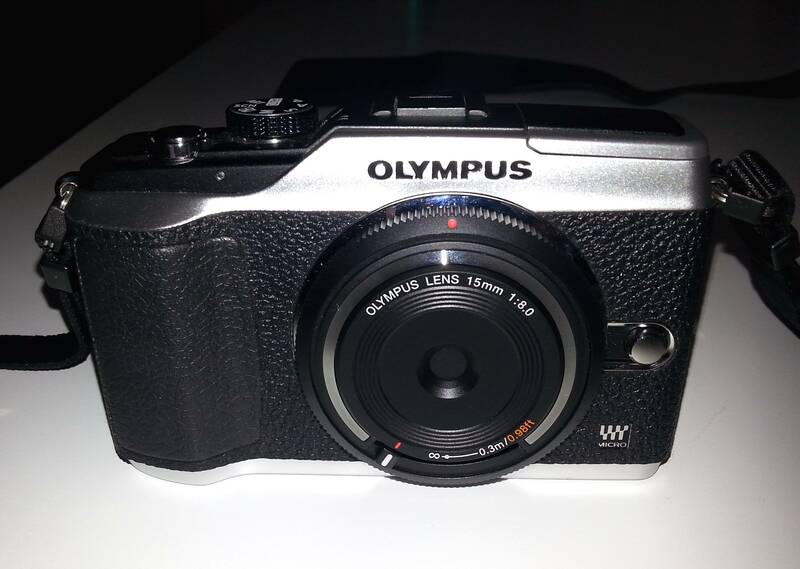 I wasn't taking my t2i with me because it was too awkward and bulky, so I decided to down-size and really liked the look of the Olympus PEN cameras. I found a good deal on a refurbished e-pl2 from Cameta, but they only had the silver (I preferred the black). Instead of waiting, I bought it and looked around for some ways to make it more mine. So, I looked for wraps/skins and found there were not many options. However, I found a couple good reviews of the skins from aki-asahi (I highly recommend him - fits great and fast shipping). So far, it's just cost $300 for the camera (1 year warranty) and skin and lens. Not a bad start. The Sigma 19 and 30 are next. And I do want to change to a wrist strap, so time to start looking for that and a cheap camera case. I can wait to start using it. Should be fun! So here is my e-pl2. Can't wait to have some fun with it. Welcome to the user group. Nice looking E-PL2 there - hope it serves you well! One other "budget" lens you may want to check out is the Panasonic 14mm. It can be had for $160 or so new on Ebay and it isn't much bigger than that cap lens. E-PL2 still rocks! I have nothing but love for mine! I can't help but worry that you're starting with the worst lens out of the whole system! Did you at least get the kit zoom 14-42 too? It's quite good. It does look nice. You'll find the 19 and 30 to be much better than the 15, although the 15 is fun. Camera looks great- hope you have fun with it! Thanks for the advice. I love working with primes, so I'll add that to my wish list. Don't worry, I know how limited the bodycap lens is. I did get the kit lens and the Sigma lenses are on their way. Had to sell my Canon lenses first. That's what I expect. Since I'm not trying to make money off of it, it's all about fun. Same here, all about fun with the :43:. Agree about black bodies, I was luck enough to pickup my gently used E-PM1 with the Franiec grip. Have the kit, 100-300, and Fotodiox adapter for my Nikon stuff. Will add the P14, might add the body cap. But for now that's probably it. I prefer silver bodies because both black and silver lenses look great on a silver body, but only black lenses look good on a black body. However, what you did with your silver body is a great idea, it looks better than either plain silver or plain black. I just ordered the black refurb E-PL2 body from Cameta yesterday (bargain at $170) as a backup body to my OM-D.
Yours looks great with the black Aki-Asahi skin. Welcome to the forum - I like that look, definitely classic. Thanks for the warm welcome! The skin turned out better than I had hoped so I am looking forward to taking it with me a lot in the future. I am thinking about getting a skin for my E-PM1 too. Welcome to the forum. I think you will really like the two Sigmas. I have them both and one is almost always on my camera. I just got the 30 so its the one I'm using the most right now. I also use legacy lenses quite a bit, but less now that I have the Sigmas. Sounds like a great way to get in for very little money, and very good choices for the money.